Every year, Latinos and non-Latinos across the U.S. celebrate Hispanic Heritage Month, a monthlong extravaganza of all things Latino that has included a bash in the White House (I wasn’t invited;) a Cielito Lindo singing collage over at Southwest Airlines and -of course- an invitation for Latinos to enjoy their heritage by eating pizza and drinking Pepsi. This year, though, this blogger would like to take a moment to highlight an upcoming beauty pageant that promises to become the event of the year (in the Dallas area, that is.) 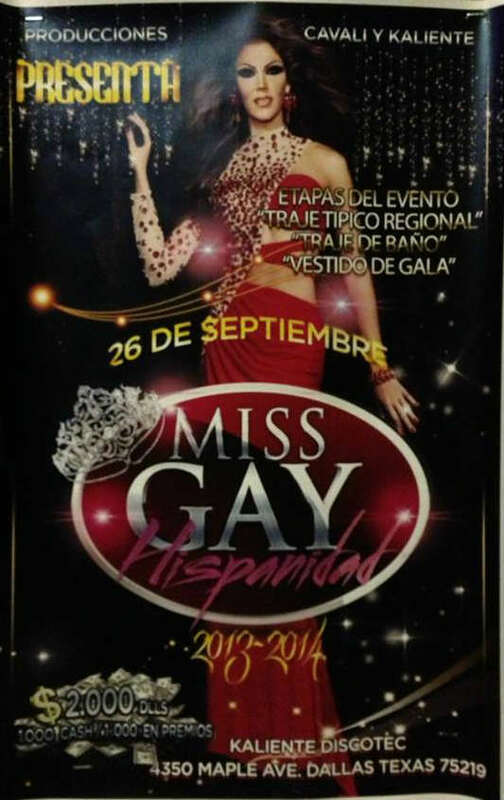 It’s the Miss Gay Hispanidad contest, offering Hispanic gays (presumably only men) the opportunity to make $2,000 by presenting themselves in a typical “Latin” outfit, bathing suit or gala dress. Calling on my Hispanic gay friends: Will-You-Please-Take-Me???? This entry was posted in Marketing & Advertising and tagged Beauty Pageants, Gay, Hispanic Heritage Month, Hispanidad. Bookmark the permalink.